After Team Stimey relaxed on the beach, we headed to the least relaxing place in the state of Wisconsin: Wisconsin Dells. I had no idea what to expect when Alex suggested we go to Wisconsin Dells. Now that I’ve been there and gone, I still don’t really know how to describe it. I guess it’s like a little resort town with a lot of waterparks and some amusement parks and then every little money-grubbing business (think t-shirt shops, go-karts, haunted houses) you could possibly think of—all housed in a series of increasingly bizarrely themed buildings. My favorite is the Trojan Horse. You could drive go-karts between the legs. 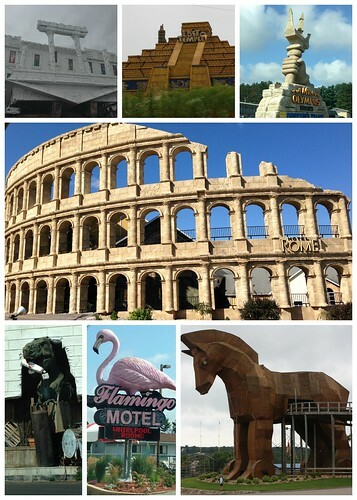 We got to the Dells in the evening, so our first night we just drove through town and gawked at all the weirdness. I’m not going to lie; it stressed me out a little. Then, the next morning, we walked past two different rude people who stared blankly at Jack after he asked them a question and then we wandered into the horribly packed breakfast buffet line at our resort and I started to freak out. 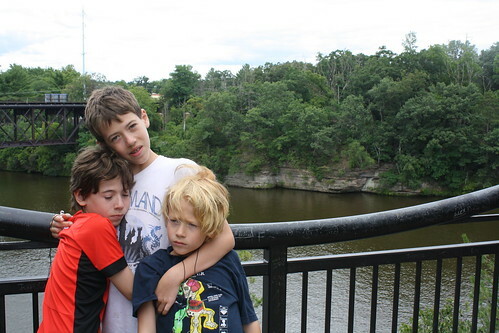 I did not like the Dells in those moments. I started to panic a little. I was trying to figure out how to ask Alex if we could check out a day early and head to our next, quiet, isolated destination early. We hadn’t even been to a waterpark yet and I was already trying to find a way to get out of dodge. That town was every kind of stimulating—and not in a charming way. It was raining our first morning there, so we headed out into the town instead of the waterpark. We started by going through a couple of those weird little tour buildings you see in the photo above. Quinn agreed to go through the first one with us, only to PANIC and refuse to walk once we were deep inside the building, leaving he and I separated from our group in the dark. I’m sure that the group knew where we were though. You know. Because of the screaming. Once we (finally) made it outside, we didn’t force Quinn to go through any more of those buildings. We did make things better by riding some go-karts and getting some ice cream. Those things almost always make things better. We had plans to go to our hotel’s indoor waterpark in the afternoon but we decided to go on a tour of the actual dells of the Wisconsin Dells first. See, the Dells are (is?) 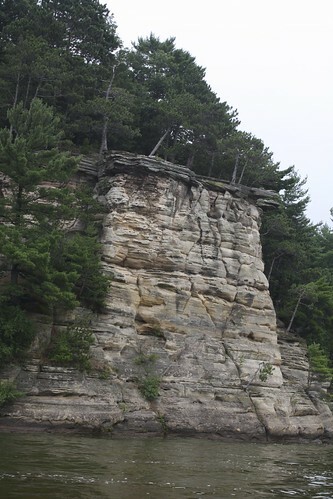 “a scenic glacially formed gorge that features striking sandstone formations along the banks of the Wisconsin River.” At least that is what Wikipedia tells me. 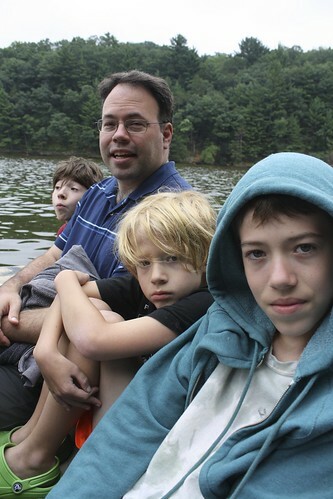 We decided that the best way to see the Dells would be by boat. 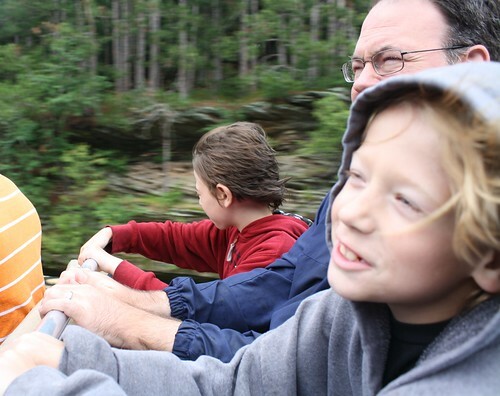 Then we decided that the best way to see the Dells by boat would be in a JET BOAT. Quinn, who fears the unknown, was surly during the waiting at the boat depot, the shuttle bus ride to the dock, the waiting on the boat for the tour to start, and the first couple of minutes of the tour. That kid always let you know exactly how he feels. Then, a couple minutes after leaving the dock, the boat driver cranked some Flo Rida, shouted, “Hang on, hang on, hang on!” and gunned the boat, sending us flying down the river and ending with a huge splash and a spin. Quinn spent about 30 seconds trying to retain his Grumpy Face until he just gave into the fun. This is his Not Grumpy Face. That Jet Boat ride was worth every single damn penny that we spent on it. All five of us ended up soaking wet, disheveled, and completely happy. To this day, Alex and I will randomly exclaim, “Jet Boat!” just because it was the awesomest of the awesome. It was still kind of rainy, so we headed to our resort’s indoor waterpark, which was exactly the circle of hell that you would imagine it to be. Our kids had a fantastic time but I just about had an aneurysm trying to make sure everybody was safe. That lazy river just about killed me. Jack jogged around the thing looking for a tube to sit in and I chased him, but he is smaller, nimbler, and more fleet of foot than I am, so while he sprinted around the river, I got bumped and shoved and my feet torn up. I was really happy to go to the outside waterpark the next day for the mere fact that it wasn’t steamy and echo-y there. All of our kids swam in the pool and went on some of the slides, but Jack was a monster. He loved the slides—the scarier the better. Trust me, nothing will make you feel like a wuss faster than watching your 10-year-old plummet down a slide and then realize you want desperately to back out, but you will not just have to take the reverse stair climb of shame if you wimp out, but you will also lose said brave child when he runs off to find some other dare devil activity. Wanna see brave? Rumors were circulating that riders went 40mph on this slide. And when you’re sitting at the top with your arms and ankles crossed, it looks like it goes almost straight down. It was terrifying. There was also this other slide that was shaped like a half-pipe. This one was also nearly straight down but you went on a tube. Jack loved this one too, but I took video of Sam and Quinn on a double tube. Alex went down this twice. The second time, he almost fell off the tube. It was hilarious. Quinn was watching and said, “Dad is steering his tube!” and I was all, “That man is NOT in control of his tube.” He almost fell off the tube on his way back down the other side of the pipe too. 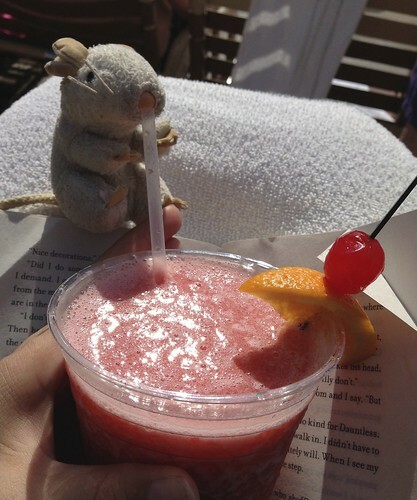 After all of the danger, Algernon had to relax with a well deserved daiquiri. He spends a lot of time at the bottom of my bag, but when I pull him out, I treat him right. The problem with having a kid (Jack) who has a terrific memory is that he’ll see a storefront and then remember for the rest of time that he wanted to go there. That is how we ended up at a “mining” company after we checked out of our hotel the following day. They call it mining, but it was really more like rinsing. The munchkins were pretty happy about this whole stop. Next time they’re bored, I might put all their finds in a bucket of dirt and tell them to sift it out again. 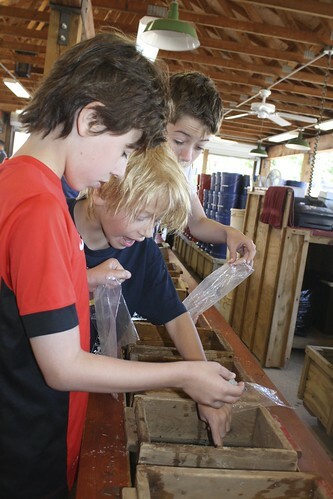 They were super excited when the gem expert told them what gems they had found. 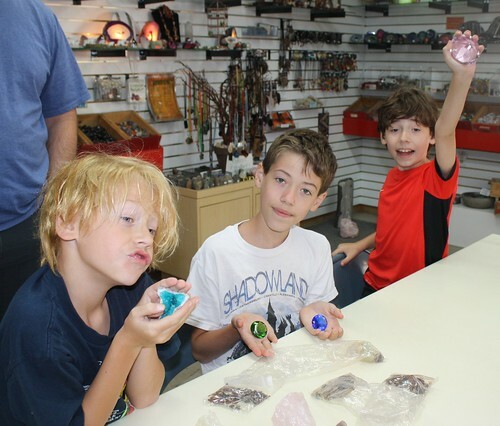 Then they bought glass gems and other rocks that were really shiny. Because…shiny. The munchkins thank you, C. This is what they bought with their souvenir money. They are delighted. 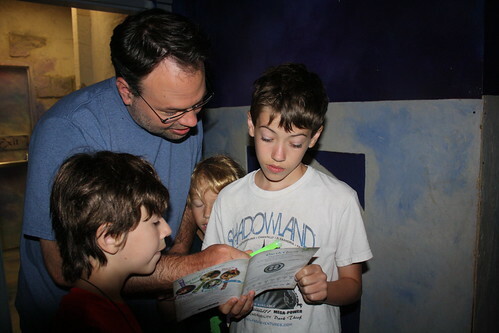 Our last stop before hitting the road was this place called Wizard Quest. 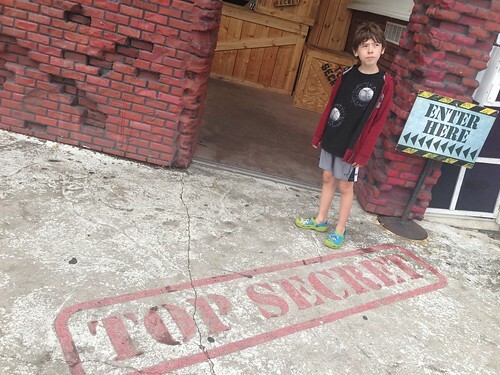 All of the kiddos are nerdlingers and love wizards and such, so this place where you tried to figure out clues and stuff to solve a quest seemed right up their alley. 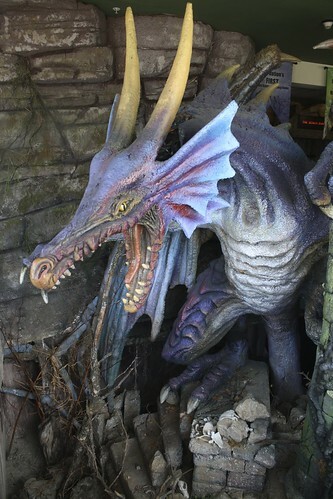 Plus, how could we resist this animatronic dragon outside? This is back near the beginning when we’d only been there a few minutes and we didn’t want to kill ourselves. The quest was pretty fun. We were supposed to find answers to questions hidden in the tunnels and mazes and nooks and crannies all over the building. My favorite part was the mirror maze, not because I kept saying excuse me to the jerk in the orange shirt who wouldn’t get out of my way only to discover that she was me, but because I got to watch both Jack and Quinn separately run full-speed into mirrors. I’m pretty sure he was kidding. He seemed to be having a good time for most some of the quest. Fresh from the outrage of the difficulty of the Wizard Quest and with my “I told you so”s ringing in everyone’s ears, we headed off to our final vacation destination, which I will probably tell you about later. Ultimately, even though my first instinct was to cut and run when we arrived at the Dells, we ended up having a really good time. That Jet Boat alone was worth the whole three days. Also, more importantly than pretty much anything, all three of my kiddos had a blast. They are going to remember this vacation for a long time. And, honestly, so will I.